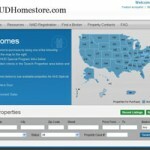 You are here: Home / HUD / Property is Missing From HUDHomeStore.com? Property is Missing From HUDHomeStore.com? Under Review- Home will still show active (ACTV) in MLS, the asset manager is reviewing bids. Price Change- The asset manager will remove the home from HudHomeStore while a new appraisal is obtained. Under Contract- Home will show pending (PEND) in MLS. ** You can create a saved search on HUDHomeStore.com, this is a great tool to alert you if a home is posted back on the website.